FOR the last few weeks, budding wordsmiths from across Greater Manchester have been plucking inspiration from historical characters and events, for the local-themed competition, Postcards from Christmases Past. In a spin-off from the on-going competition, Postcards from the Past, a panel of judges from MMU sifted through sacks of entries covering a variety of festive themes, eventually agreeing on six lucky winners, who were announced on Friday. John Herbert, 54 from Rochdale, Patricia Brock, 73 from Salford, Joseph Noble, 10 from St. John Fisher R.C Primary School, Christine Penney, 45 from Stockport, Noreen Dermody, 56 from Stretford and William West aged 62 from Chorlton, impressed the judges with their well-written, imaginative and touching messages, which are soon to be featured in their local newspapers. From school history projects to keen postcard collectors, each individual had their own reasons for entering the competition. Each postcard uniquely encapsulated the Christmas festivities, be it through a moving story passed down through family generations, a celebration of the thriving hat industry in Denton in 1872, or whilst seeking shelter during a terrifying Christmas Eve bombing raid in 1940. 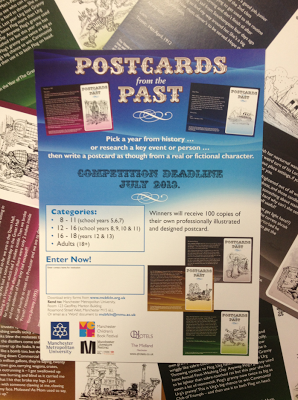 The winners will be automatically entered in the Postcards from the Past competition, a collaboration from the Manchester Children's Book Festival and the Manchester Literature Festival. It is free to enter and open to anyone from age 8 upwards. The competition invites participants to write a postcard from a real or fictional character, which can be from any chosen time in history. Winners will get to have their postcards designed professionally and will receive 100 copies. The the deadline is 20th July 2013, so start writing!